It is very difficult for someone to read through the historical data for token swapping networks. In absence of such tools, the only way is to manually look through transaction records on block explorers. Kyber lacked such a tool and had a good bounty for this so we took up the challenge. KyberWatch is an API and a visualization tool which the users can use to query the historical price and volume trade data for the different tokens supported on Kyber Network. KyberWatch queries the volumetric data from the Kyber smart contract transactions for the token swap events. All the queried data is cached in a MySql database on an AWS instance for faster access. 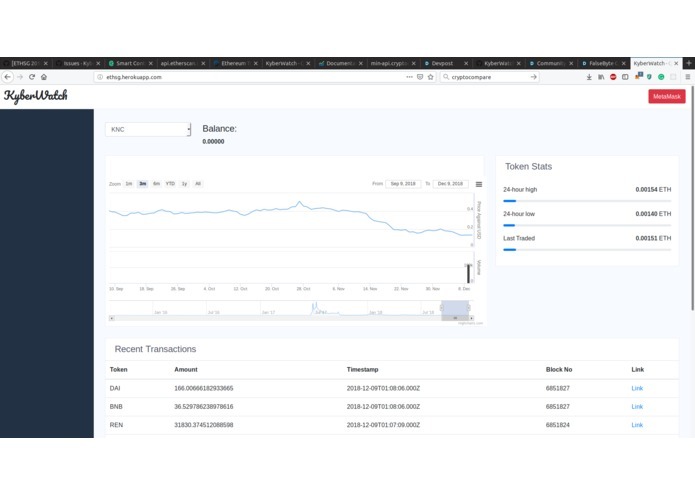 We query the cryptocompare API for getting the price history for the tokens.KyberWatch also allows to unlock their metamask account and check balances. We initially planned to get the price history from the Kyber contract events for token swaps but found it to be really complicated process to achieve using etherscan API's. Another challenged we faced was querying a very big block interval made our API's very slow to use. We are proud that we could build a working prototype in the stipulated time and our tool and API scale pretty well. Giving up completely on sleep for 2 consecutive nights is never ever healthy!